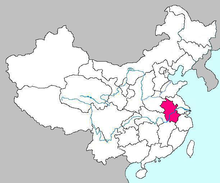 Anhui (安徽; Ān​huī​) is a province in the southern central region of China. Historically, it is a relatively poor agricultural province, and over the past few decades it has been one of the main suppliers of cheap migrant labour to more prosperous coastal provinces, especially in nearby East China. In the 21st century, Anhui has begun developing quite a bit of modern industry. Anhui is less than three hours from Shanghai by high-speed train. With the Yangtze River and Huaihe River crossing it, it is divided into three parts: South Anhui, Middle Anhui, and North Anhui. It has a semitropical climate with four distinct seasons. Huangshan (Yellow Mountain) is a famously scenic area with an important temple. This region travel guide to Anhui is an outline and may need more content. It has a template, but there is not enough information present. If there are Cities and Other destinations listed, they may not all be at usable status or there may not be a valid regional structure and a "Get in" section describing all of the typical ways to get here. Please plunge forward and help it grow!